The easiest way to distinguish between a rambling rose and a climbing rose is their flowering habit. A climbing rose will repeat-flower almost all summer whereas a rambling rose will only flower once. 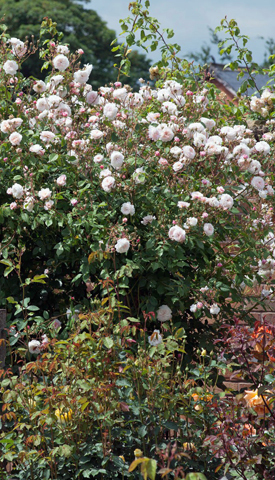 But as with climbing roses, failure to prune them can result in a tangled mess of branches with very few flowers. Prune in late autumn after the flowers have faded or the hips have reddened. Alternatively leave until after leaf fall. Formative: Initial tying into the support. Routine: As the name suggests annual pruning. Renovation: Treatment for a plant that has been allowed to grow out of hand. After planting, prune stems back to 400mm (16") then carefully fan them out up their support then tie them in where they make contact with the support. If necessary, remove any dead, damaged or twiggy growth. If space is restricted, prune out all stems that have flowered and tie in the new ones to replace them. Renovation can be carried out at any time between late autumn and late winter. Cut out all but five or six old woody branches to the ground, and tie the remaining branches into the framework. Do not leave dead stumps at the base of the plant, rain can collect here and encourage rot.